Shopping heaven at Mr Porter! The most exciting news in male shopping / fashion EVER. This is it. Doesn’t get any better than Mr. Porter. Ever since I got introduced to Net A Porter what seems like many years ago, I have been waiting for someone to give us guys something similar. Net A Porter launched in 2000 (it’s been 11 years, wowser) and has revolutionised the way women can access fashion online. It is filled with all the major brands and some amazing cult favourites. They seriously have every label worth mentioning under the sun and then some. You can imagine my frustration, while I have been looking at their extensive shoe and accessories collections, wishing there was a site that I could go to and click-through a similar offering for ME, instead of my girls. Last year already at a fashion party, I overheard people talking about Mr. Porter and I was intrigued. Could this be true? Was someone masterminding this and more importantly why wasn’t I invited to join the team? 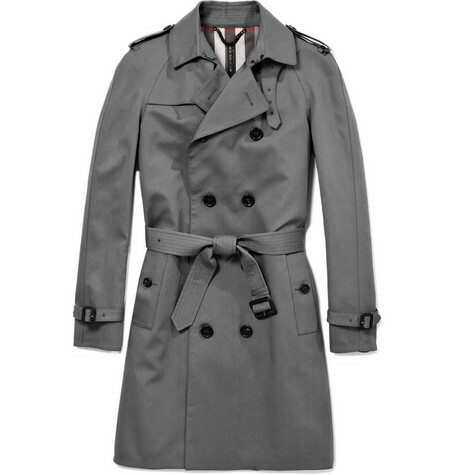 Trench Coat by Burberry Prorsum. OMG. Just when I thought I would be happy with the coat I found in TopMan, I have now come across this offer from Burberry Prorsum. Simply the perfect shade of grey. I must have it. It the perfect start for this outfit. Simple and classic, something I would wear for many years to come. It would come so handy on the school run. Let it rain, I wont care. I will be wearing BP. 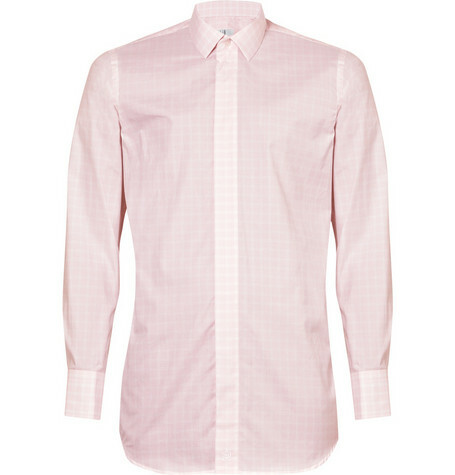 Pink Narrow-Plaid shirt by Alfred Dunhill. Pink and patterned. Done. It’s also a very narrow shape, would wrap nicely around my impossible physique. Its “gay pink” and I must have it. I have NO pink shirts, this must be some sort of global misunderstanding. I must inject some pink into the wardrobe asap. This shirt would start the collection nicely. Acne Cotton Cardigan. As you all know, I am very partial to my cardigans from Uniqlo. However, this Acne one seems perfect. Nicely fits in with the pink gay shirt and the classic trench. It makes the entire look a little more casual, unless of course I wear a tie. Perhaps I should. Ooooh. Tie in a clashing colour and pattern, yes I need a tie. 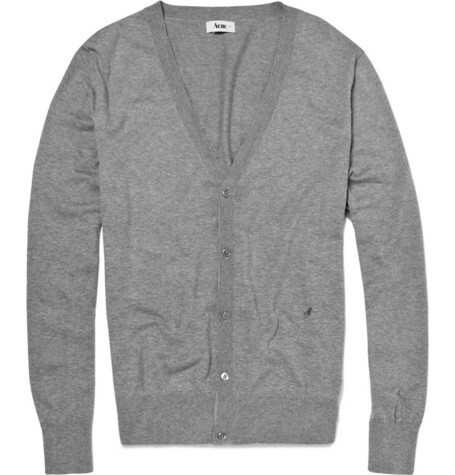 Perfect grey cardigan, right here! 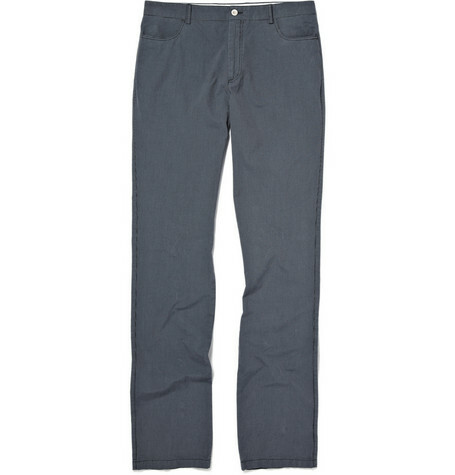 Slim-Fit Cotton Toursers by PS by Paul Smith. Since I started on the grey, I may as well keep going. That gay shirt shall be the only colour in this look. It will scream gay, but that’s ok. I am gay after all. These narrow cotton trousers would be just fabulous. Again with the grey (am I feeling a little moody today? ), but the fact remains, I look great in grey. Not going to try to fight it, but instead work it out. I would wear them fairly fitted, on the verge of leggings to emphasise these muscular legs and then some. 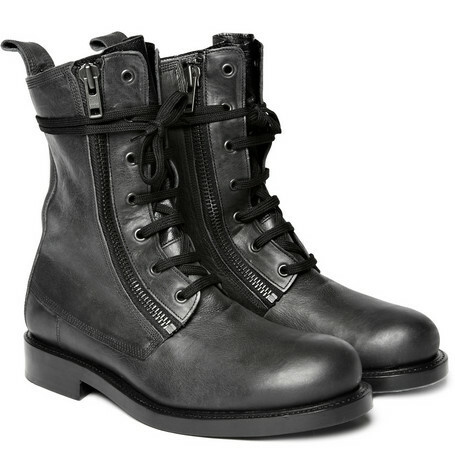 Side Zip Leather Boots by Balmain. I am still dreaming of boots for myself. I keep wearing the man’s boots, which are few sizes too big, so I wear them with three pairs of socks. The shame. These Balmain beauties are on the top of my wish list. I must get a pair. Love the zip, they look chunky and heavy without looking like construction boots. I adore. I want. (pretty please). Adore! Please let me test drive! 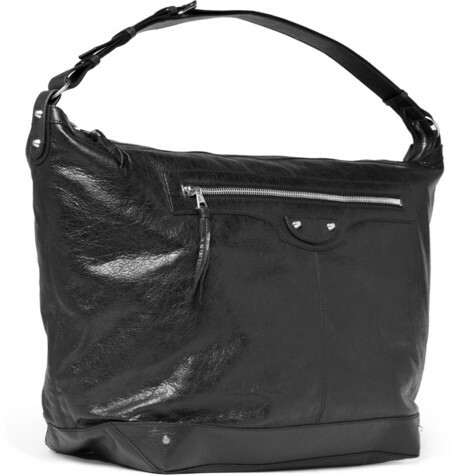 Large Leather Bag by Balenciaga. As obsessed as I am about shoes, bags come second nature to me. I can’t remember the last time I have left the house without carrying some sort of bag. My trusted YSL number has now been worn to death. It’s still gorgeous. The leather has aged and the bag is big enough to carry the dogs in. This Balenciaga number is my dream boat. Over sized amazingness. Throw this over my shoulder and BAM. Ready to lunch, gym, weekend break, shopping and then some. Thank you for coming, I have been expecting you, Mr Porter.